My bag after smoothing it out. I always get worried when I see a bag like this in my mailbox. 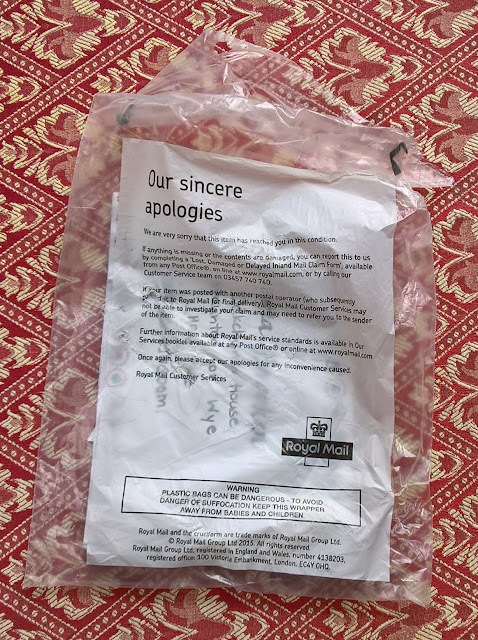 It's even worse when, like this bag, it was shoved carelessly under the front door instead of being put through our mail slot and looked more like an accordion when I espied it on the floor behind the door. I understand the machines at the post office sorting room can tear envelope flaps or rip corners off postcards but some of the post I receive in these bags makes me wonder what really happened. For instance, once I received an envelope neatly slit on the side, but no letter. This particular envelope I received the other day was torn on three sides, luckily Tracy put everything in a smaller heavily decorated envelope inside this one so nothing went astray. Had she not, I would have gotten a flimsy, envelope connected only by two tenuous folds of paper. It almost looks like someone put their finger under the flap to open the letter and ripped around three sides. I'm grateful it was recovered and put into the plastic bag but I didn't really appreciate it being shoved under my door into a scrunched up wad causing more damage. I know budgets have been cut and time is of the essence for our mail carriers but in this instance, I wish they would have slowed down and taken a little more care. Okay, now I'm done with my rant. By the way, it was a fabulous letter from Tracy with fun tuck-ins and that made up for all the angst of seeing that crumpled up bag stuck behind the door when I came home.